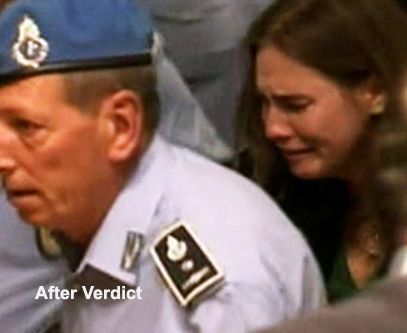 The final verdict in Italy's longstanding prosecution of Amanda Knox was delivered orally in March by the Court of Cassation, Italy's top criminal court. By law, the court has to follow up with a written ruling. The opinion has now been released. It says the case against Knox was very weak, there was no biological evidence linking her to the bedroom where her roommate was killed, prosecutors should have known the case was shaky early on. Italy’s top criminal court has scathingly faulted prosecutors for presenting a flawed and hastily constructed case against Amanda Knox and her former Italian boyfriend, saying Monday it threw out their convictions for the 2007 murder of her British roommate in part because there was no proof they were in the bedroom where the woman was fatally stabbed. It's over, for good. Amanda Knox can finally put this horrific 8 year ordeal behind her. 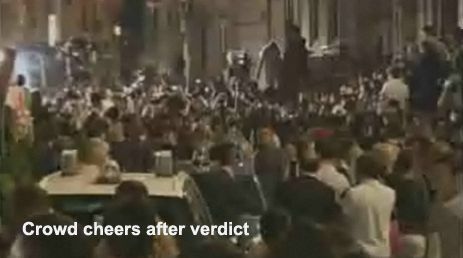 Italy's Supreme Court of Cassation has fully exonerated both Amanda and Raffaele Sollecito of murder. The supreme Court of Cassation panel deliberated for 10 hours before declaring that the two did not commit the crime, a stronger exoneration than merely finding insufficient evidence to convict. ...The decision to overturn the convictions without ordering a new trial amounted to a rebuke of another high court ruling two years ago that vacated Knox and Sollecito's 2011 acquittal, ordering yet another trial. The Supreme Court in Italy will rule Friday on yet another appeal in the Amanda Knox case. If she loses, will she be extradited? Will Italy even file the request? I don't think given the unique and twisted history of the case, disputed facts and the different and lesser protections afforded defendants by the Italian legal system, which allows prosecutors to appeal not guilty verdicts and according to some news reports, considers jeopardy not to attach until final judgment is rendered after appeal, the U.S. would grant an extradition request. Nor do I think a diplomatic showdown will result if it refuses. This case needs to be put to rest. 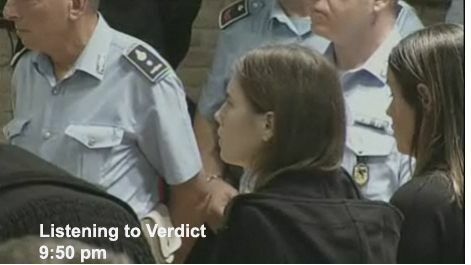 An Italian court has convicted Amanda Knox of murder at a retrial, sentencing her to 28 1/2 years in prison. Knox, who lives in Seattle, says she won't return to Italy. The judge has 90 days to issue a written ruling, and the defense can appeal it. It's unlikely she would be extradited. It is unlikely that Knox, who lives in Seattle, Washington, will return to Italy to serve additional prison time because U.S. law dictates that a person cannot be tried twice on the same charge, a legal expert told CNN. He believes that if Italy were to ask for extradition, U.S. officials would deny the request. Her ex-boyfriend Raffaele Sollecito was also convicted and sentenced to 25 years. He attended portions of the trial and testified at one point. He is an Italian citizen and remains in Italy. It's likely Italy will revoke his passport but he is not expected to be arrested before the judge issues his written ruling. 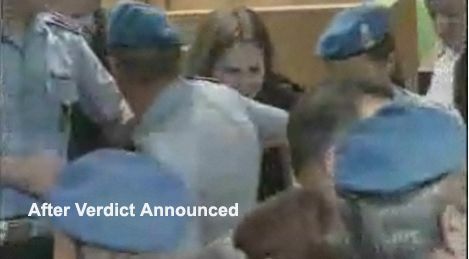 The Supreme Court in Italy has overturned Amanda Knox's acquittal by a lower appeals court. 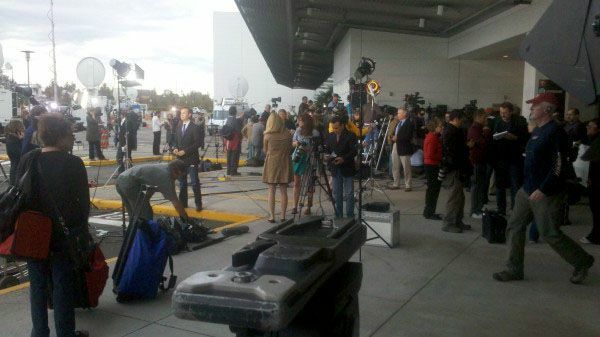 According to media accounts, a new trial will be held. According to her U.S. Attorney, Ted Simon, only a "revision" of the acquittal was ordered, which is like a reconsideration, and it's far from certain a new trial will occur. He characterized the outcome of Tuesday’s court decision as a "revision" of the case, as opposed to a retrial, saying: "Merely because they have sent it back for revision does not mean that anything else will happen other than she will be recognized as not guilty and the same thing will happen again." Raffaele Sollecito, the co-defendant of Amanda Knox who was also acquitted of murder this week by the appeals court, alleges the police treated him violently and with coercion after his arrest. 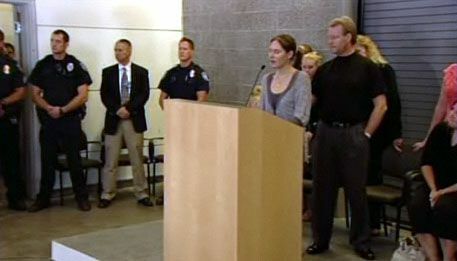 Amanda Knox has said in the past she was assaulted and browbeaten by police. Claudio Pratillo Hellmann, one of the two judges advising the jury suggested in an interview today that perhaps Amanda and Raffaelle know who was involved in Mereditih Kercher's killing. Update: 6:43 pm MT: It's over. Amanda had a range of emotions from happy to teary. 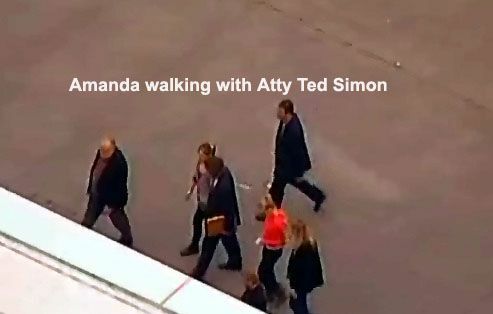 Here's Amanda walking from the plane into the terminal with lawyer Ted Simon; Here's Ted speaking at the press conference; Here's Amanda speaking. 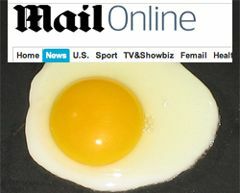 I usually like the Daily Mail reporting despite its tabloid nature. It also has good photos. Today it made a big misstep. 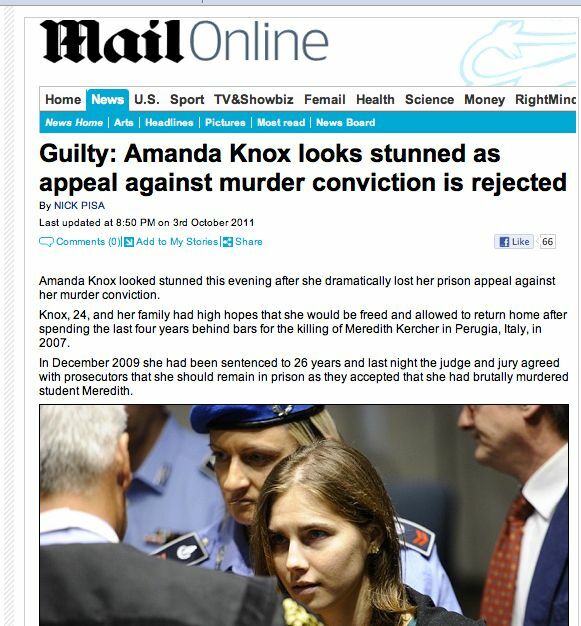 Via Gawker and Malcolm Coles: In its hurry to be first reporting the Amanda Knox verdict, the Daily Mail got it wrong, and hit the "publish" button on a pre-written article pronouncing Knox guilty. The article even included reaction quotes from the prosecution. Prosecutors were delighted with the verdict and said that 'justice has been done' although they said on a 'human factor it was sad two young people would be spending years in jail'. Here's a screen grab of the article, which the Daily Mail corrected minutes later. 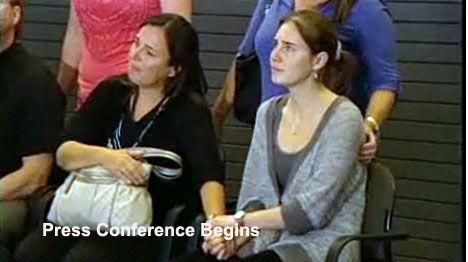 Update: Amanda Knox's nightmare is over. She's free. Her murder conviction is overturned. Only the slander charge against police was upheld. 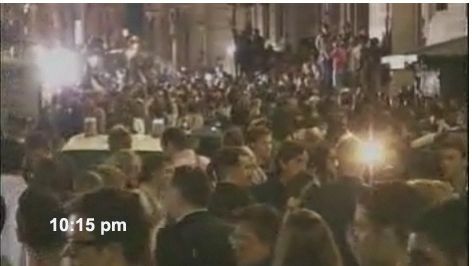 Raffaele Sollecito was also freed. 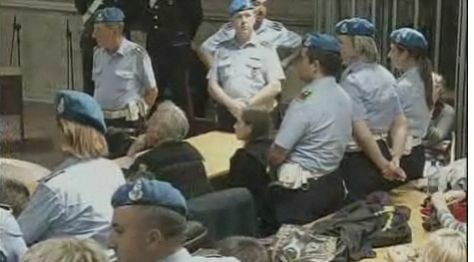 Here's Amanda listening to the verdict, after the verdict is announced, being led out of court, and the crowd outside which was cheering. One half hour later, they are still outside. 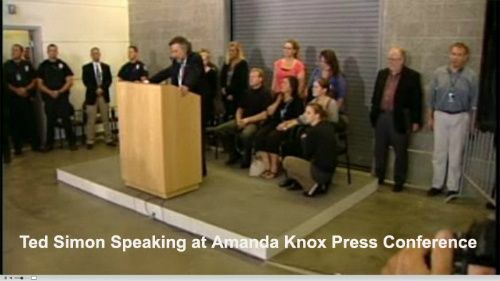 Amanda will soon leave this prison. 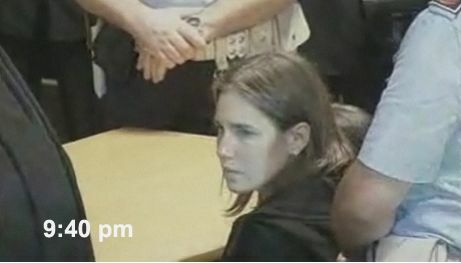 Five inmates testified in for Amanda Knox today at an appeals court hearing in Italy. Prosecutors are doing everything they can to say these witnesses are hardened criminals who can't be trusted. An appeals court in Italy has ruled independent experts will review the DNA evidence presented to the jury in the murder case against Amanda Knox. The key to the prosecution had been a 12-inch kitchen knife. Genetic material - but not blood - on the handle was linked to Knox, and similar material on thhttp://www.talkleft.com/admin/storye blade to Miss Kercher. Defence lawyers argued that the DNA traces were too slight to be reliable. Meanwhile the bra clasp, on which Sollecito's DNA was found, had been "lost" for six weeks after it was taken as evidence and could have been contaminated, his lawyers said. 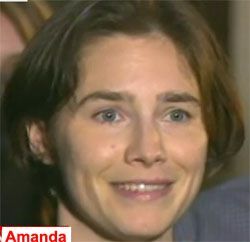 Italy insists Amanda Knox's conviction and 26 year sentence for murdering her roomate is fair. Some think she has a good chance on appeal. Others say she was the victim of anti-Americanism and never stood a chance.